With vast lake views, exceptional craftsmanship spread across three levels, and an expanse of backyard bliss that incorporates multiple water features, an infinity hot tub, putting green, and numerous terraces that step down to Lake Keowees clear waters, 610 Sweet Fern Trail is a not-to-be-missed gem. Past a gated entry and at the end of a long paver drive bordered by boulder retaining walls, the home presents an impressive facade of stone and masonry siding. Double doors lead to uninterrupted lake vistas on the opposite great room wall. Calm neutrals mix with a stacked stone fireplace, plank ceiling, and built-in shelving. Folding glass doors open wide to the first of two waterfront screened porches with stone fireplace. Built around a grand island, the kitchen is handsome and hard-working. Gourmet dreams come true with a collection of premium appliances: Dacor gas range with double ovens, Sub-Zero fridge with custom paneled doors, separate freezer drawers, paneled Miele dishwasher, dishwasher drawer, and walk-in pantry. 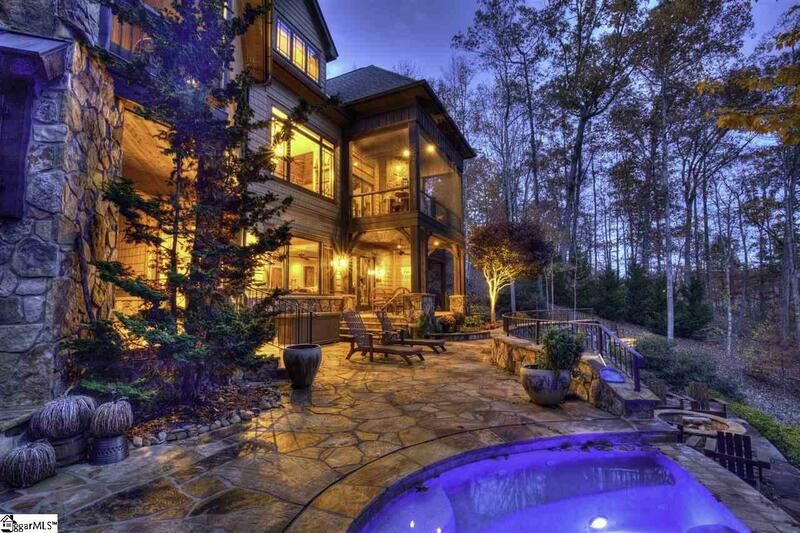 Just off the kitchen is the homes second screened porch, again with stone fireplace, and an adjoining grilling deck. The main-level master suite has a private deck, while the en suite includes his and her vanities topped with leathered granite, corner jetted tub, and multi-head shower. The closet offers furniture-grade storage systems, as well as a stacked laundry center. A window-lined stairway ascends to the upper level and two generous bedroom suites, one with a built-in daybed in a window-lined nook, and the other of apartment proportions with a kitchenette. The lower level provides a consummate family and game room with stone fireplace, built-in cabinetry, and rich bar kitchenette. Arched doorways lead to a stone-walled alcove and wine closet. The homes fourth bedroom suite is on this level, as well as a full laundry room, and, housed beneath the garage, a large home gym. The jaw-dropping back yard is framed by a natural stream to the right, and, to the left, a spectacular water feature that spills some 150 feet down the gently sloping hillside and integrates over ten cascades, a koi pond, and an arched stone bridge. A putting green provides a pretty spot for practicing ones short game. Numerous stone terraces/patios, connected via pathways, artistically dot the landscape. Those closest to the home are covered, one has a fireplace, another an outdoor shower, another an infinity-edge hot tub, and another a fire pit. The covered dock with lift sits in deep water that fronts a wide channel, yet it is tucked in a short cove that shields it from boat traffic. 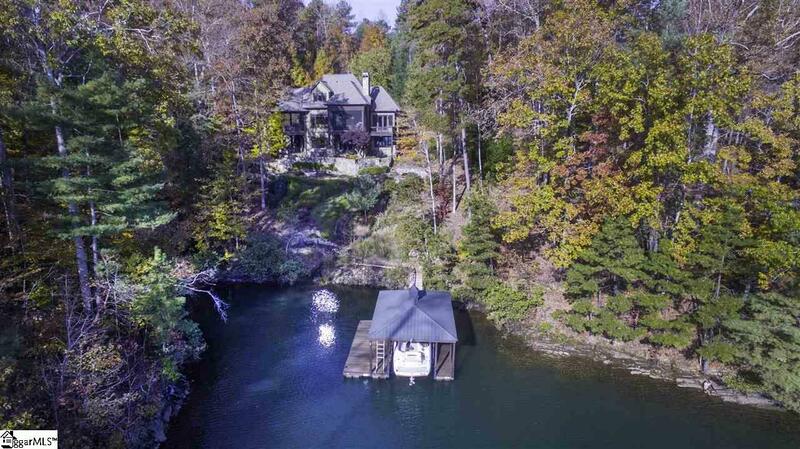 This wonderful estate is located in The Cliffs at Keowee Falls, a Lake Keowee community with a full suite of country-club amenities, including a Jack Nicklaus signature golf course, clubhouse with multiple dining venues, staffed wellness center, resort-style pool, tennis complex, miles of walking trails, parks, and more.